I was asked to post our cornbread recipe. So here it is. This is one of my daughter's favorite foods, so we have it often. It's baked in the microwave in 3 1/2 minutes, using a fraction of the electricity of a standard oven. There is no pre-heating of an oven, no heating the kitchen up, and I can think to add it to a lunch or dinner menu at the last minute, and have it on the table in 10 minutes, start to finish. This cornbread comes out moist, which is what I think my daughter really enjoys about it. And because it's a cornmeal product, it already has "color", and doesn't look pale and pasty, as other microwaved breads often do. I have these small Corningware casseroles. (I see them frequently at thrift shops and garage sales, btw.) 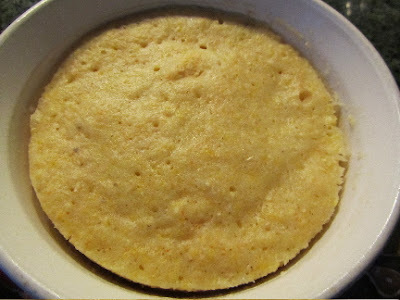 They are the perfect size to microwave cornbread in, about 5 inches in diameter. I use 2 at a time, to bake 8 small wedges, which is just right for our family. To make 2 of these small casseroles, I bake a half recipe. Baking just half works for us, as that's all we need at a time, and it bakes up so quickly. Just an FYI, to halve a large egg, simply beat it well, and pour or scoop 2 tablespoons into your batter. Cover and save the other half-egg, in the fridge for up to 3 days, to use in cooking, or freeze. To freeze half of an egg, beat in 1/16 teaspoon salt, or 3/8 teaspoon sugar, pour into a small freezer container and label (to use in your next half-batch, requiring 1/2 an egg). My recipe calls for microwaving in a microwaveable 2-qt. ring mold. As other quick breads/coffee cakes can be microwaved in an 8-inch round or square. I would think that should also work for cornbread. 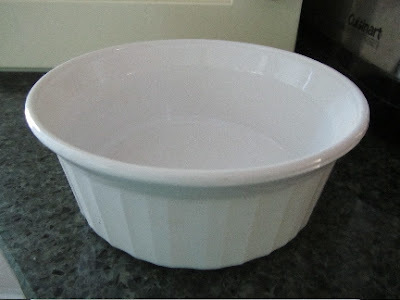 But if you have a few small casserole dishes, as I do, then the microwave bake will take less time. You could also bake individual cornbreads, in custard cups. In a large mixing bowl, combine cornmeal, flour, sugar, baking powder and salt. Beat together egg, milk and oil. Combine liquids with dry ingredients. Pour into well-greased 2-qt. microwaveable casserole (or a couple of smaller casseroles). Your timing on the baking will likely differ from mine, slightly, as wattage varies among the different microwave ovens. If your microwave does not have a turntable, you will want to turn this, a quarter turn, half way through baking. Microwave baking takes a watchful eye. Watch the center of the item as it bakes. The center finishes baking last. When it looks set and dry in the center, as the edges do, press a finger into it. When done, it should feel firm. Remove from microwave. 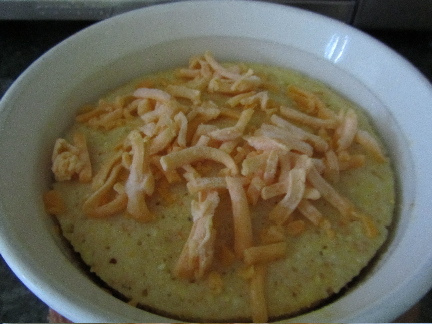 If topping with grated cheese, sprinkle on top of baked cornbread. Place a dish or tray over the top, to hold in the heat while the cheese melts, about 3 minutes. I really under-utilize my microwave, you have inspired me to actually try cooking in it! I've enjoyed the ease of microwave cooking this summer. I can pull together a dinner in about 15 minutes or so, giving me more time in the garden, or just enjoying a summer's day. your bread looks good. i wish i had a microwave!!! Isn't a microwave oven on your Christmas wish list? Maybe Santa will be very good to you this year! I hope your weekend is lovely, as well! 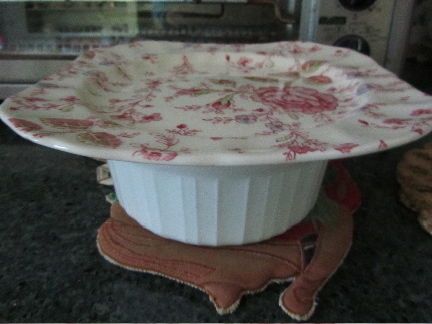 If you want to use a larger dish and don't have a ring mold, it's easy to just put a glass in the middle of the dish. This helps not having the middle underdone. However, sounds like you have figured out what works well in your microwave. Several years ago, I did some baking in the microwave. However, I haven't done any since we got this new one. I would have to spend a little time calibrating things if I were to start doing it again. Thank you for that tip! I had seen that done, years ago, with a custard cup upside down in the center of a round casserole. I'l have to give that a try. 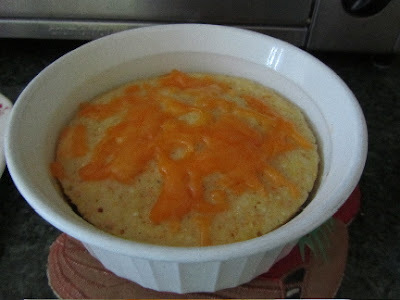 This looks tasty :) I just made cornbread for the first time ever last week, and it was really good. I like the idea of sprinkling cheese on the top. So I gather cornbread is not a staple in Australia! In some parts of the US, I think it's practically one of the 4 food groups! Oh, cornbread is yummy with cheese both on top and mixed in the batter, as well as ham chunks, bacon bits, chopped jalapenos, diced green or red sweet peppers,green or black olives, chopped sun-dried tomatoes, diced red onion, various fresh herbs, and for a slightly sweet version -- chopped dried apples. Now that you have made cornbread, once, just think of all the possibilities! And next, you'll have to try spoonbread -- now that is tasty stuff! Thank you - I emailed you asking about this! Do you eat this - I remember you mentioning you trying to go gluten free? Have you used GF all purpose flour and had it work? Now what is spoonbread? I did make cornbread two weeks ago with some spices in it - it was a little hot for the BF but I enjoyed it! And it was a great 'base' to fill me up before eating too much meat!! I haven't tried this gluten free yet. I usually make this with dairy milk, which I can't have, so it's just for the rest of the family. I'd be curious to find out if it does work with rice and millet flour. It may be just a tad more crumbly, but otherwise good. Any GF recipe that calls for egg seems to do well for me. Oh, spoonbread! Yummy stuff! It's a very moist and eggy cornbread, that you scoop out of the baking dish with a serving spoon, instead of cutting into servings. It's especially good with bacon or ham in it, and can be the main dish for a simple supper. The recipe I use for that is in The Joy of Cooking. Using your cornbread as a base to fill you up, before eating too much meat is a lot like the origins of Yorkshire pudding. A baked egg, milk, flour and meat drippings dish was served to the hungry family *before* the joint of meat was brought out, to fill everyone up, so a small amount of meat would go further. or leave a gap through which steam my escape.